Pearl Jam fans who were able to score tickets to Friday's sold-out concert at Wrigley Field -- many of who braved the sweltering, 90-degree Chicago heat to wait outside in three-hour long merch lines hours before the show began -- may still be recalling, even months from now, the rarities of the evening. It was a special show, if not for the fact that longtime Cubs superfan Eddie Vedder was playing centerfield, than for a dramatic setlist -- a gift for diehards that included scarcities like 1994's Vitalogy track, "Bugs," a song that has been performed live only three other times, with Vedder on accordion -- or for a show that spanned nearly seven-hours long, wrapping at 2 a.m., after strong storms in the area forced a two-and-half hour rain delay that took effect just seven songs into the evening's set. 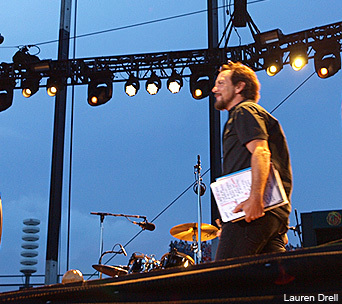 Severe weather had been predicted in Chicago's forecast and when Vedder finally made the announcement that the band would have to temporarily halt the show for safety reasons (it appeared as though he was receiving weather updates in-between the last couple of songs before the concert went on hiatus), Vedder promised that the band would come back hard. "Will you trust me on this?" he asked, reassuring fans that the 11 p.m. curfew would be extended. As the field cleared, most took shelter inside the hot and humid Friendly Confines where sweaty fans stood packed in against each other, creating snaking lines at the food and beer concession stands. At approximately 11:45 p.m., Vedder reappeared on stage announcing that Cubs legend Ernie Banks would say, "'Let's play two,' I say, 'Let's play until two.'" This created a stir amongst folks who had just returned to their seats. Vedder then broke into his Cubs tribute, "All The Way," to recharge the sweat-drenched, soggy and soaked who were still occupying nearly every seat in Wrigley and the surrounding rooftops, despite the lengthy weather delay. Soon after, Vedder welcomed Banks on stage and handed him a baseball glove Vedder said he had since he was five-years-old. Banks looked out amongst the crowd and told cheering fans, "I'm so happy to see you all in my house." Much like PJ20, fans traveled to Chicago from both near and far and were treated to a setlist that included gems like Mother Love Bone's "Chloe Dancer/Crown of Thorns." Before breaking into the pair of songs, Vedder thanked guitarists Mike McCready and Stone Gossard, and bassist Jeff Ament, for "taking a chance on a young kid" and inviting him join their band over 20 years ago. Pearl Jam also introduced new material from the band's forthcoming album, ironically titled, Lightning Bolt, set to drop on October 15. 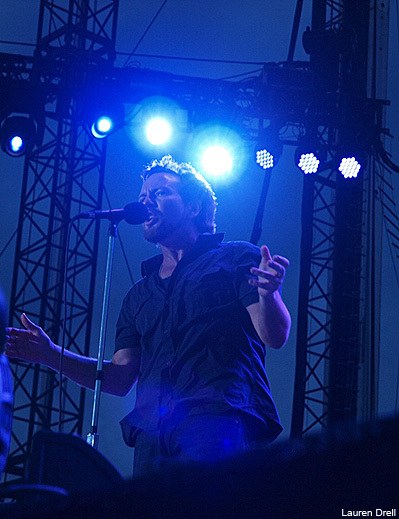 Love ballad, "Future Days," was played live for the first time, with the help of the band's longtime producer Brendan O'Brien who took on keyboard duties. Other highlights included McCready's supercharged guitar work during "Evenflow," shredding frets with his guitar positioned behind his head, Pink Floyd's "Mother" and "Porch," which transported many in the sold-out 40,000+ crowd back to the heyday of flannel a.k.a. the '90s, as Vedder was spotted crowd-surfing and swinging from the green-lit globes hanging from the lighting truss. As part of Pearl Jam's dynamic seven-song encore that closed with Neil Young's, "Rockin' In The Free World," Vedder shared a poignant story of how, as a kid, he used to watch Cubs games on his black and white television set. When he made his first trip to Wrigley for a Cubs game, he recalled being overwhelmed by the way the ballpark looked in color and noted that he saw "the greenest greens." From standing on stage in centerfield at Wrigley on Friday evening under the night's sky, Vedder looked out onto the sea of people all across the baseball stadium and rooftops as it was nearing 2 a.m., and told them that "Dreams come true." While many Cubs fans are still holding out that kind of hope for their team, after Pearl Jam played the historic ballpark on Friday night, lucky fans can at least cross one more item off of their own wish list. As the merch lines outside the ballpark stretched to three-hours long hours before the show, many stopped to snap up the Wrigley sign that brightly displayed in daylight, "An Evening With Pearl Jam."